I am a big fan of the local Dollar Tree in our neighborhood. It is my go to place for paper products and cleaning products. I often find cute things to repurpose into darling decor for my home, especially at Halloween. 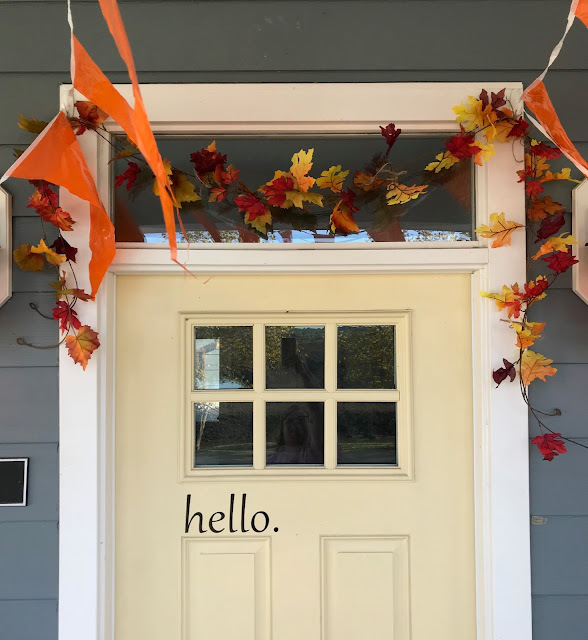 I have been wanting to create a fun garland for my door. I have been shopping around at our local floral and gifts shops and most of what I found was expensive. In our neighborhood there is a lot of building going on, so I didn't want to put out something that would get filthy with dust and dirt from the construction sites. I decided to head to my neighborhood Dollar Store. I didn't know what I might find, but I was pleasantly surprised to find strands of garland as a base. I added in some other silk flowers, leaves and twine, and got to work! 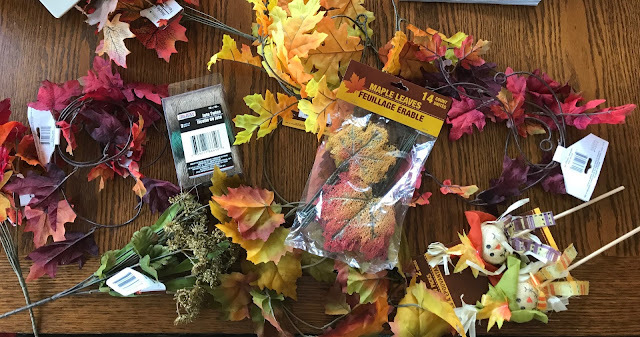 This was what I brought home: 4 strands of 5 foot leaf garland, two mini scarecrows, leaves, twine and some silk flowers. I laid out the garland and tied two together to make one 10 foot garland. Then I intertwined the other two five foot garlands and tied them with the twine. This made a great base. I tied in some of the leaves. This created enough of a garland that I didn't need to add any more. I used the silks to fluff out my basket. 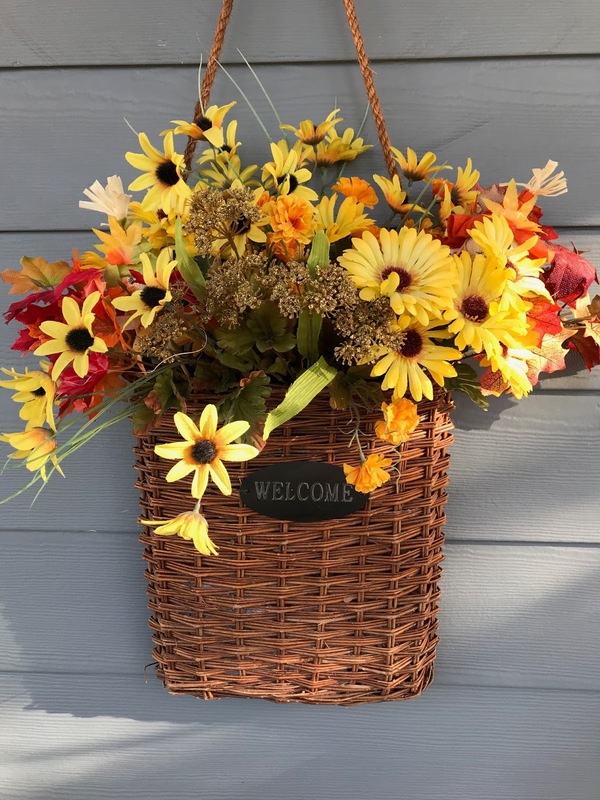 I am very pleased with my fall garland and basket! Closer to Halloween I will add some fun pumpkins and the scarecrows I purchased. For now, I am enjoying my pretty fall look! 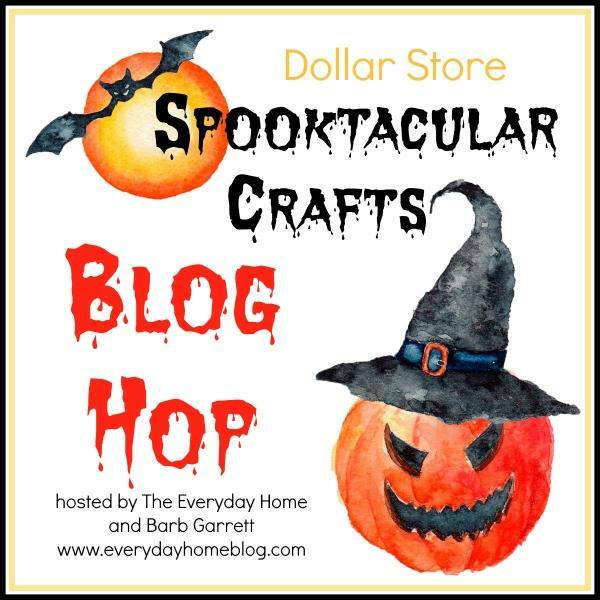 Please join Barb Garrett of The Everyday Home and all of these other fabulous bloggers participating in this Dollar Store Halloween Crafts Blog Hop.